Wow, awesome review, and just echoes how I feel about Bourdain too. I truly respect how he shows humility and gratitude whenever a family welcomes him into their home for a meal and tells the viewer what an honour it is, especially in some of the poorest countries. He truly is a man of the people, not just a Food Network "personality". OK.. question.. I'm not slamming you... but isn't posting something like this a little antithetical to your premise of being "poor?" I mean.. I get it.. you can scrimp and save for something like this.. but still. I wanted to go to Anthony when he hits Atlanta, and I don't quite have it in the budget, so I'm a little surprised to see this here. @KelleBelle: I completely agree! He really is a man of the people. Great review! Thanks for sharing the evening. Wonderful report, and maybe it makes ME a snob, but the fact that you can spell "countries'" correctly, with the apostrophe in the right place and everything, endeared you to me even more. This makes me so excited for my evening with Bourdain and Eric Ripert on Thursday this week!!! Trying to decide where my husband and I should go for dinner beforehand is the real issue...glad you had an awesome time! Great review. Like you, we didn't know exactly what to expect that night in terms of format, but we knew it would be well worth it - and it was! I'm currently re-reading his books and am pleased to find that they, like the man himself, continue to be true, timely, and at times, laugh-out-loud funny. Thanks for sharing. 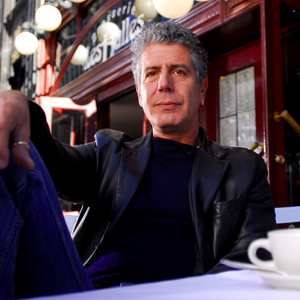 Bourdain's been my hero forever and you did him justice. He's amazing and so appreciative of everything he has - good thing for us all to think about. Oh! Lucky you!! Its my dream to meet him face to face! !